I'm writing doing some analysis of the network to understand the system better. One thing I did was count the number of unique keys per 5000 blocks generating the block. 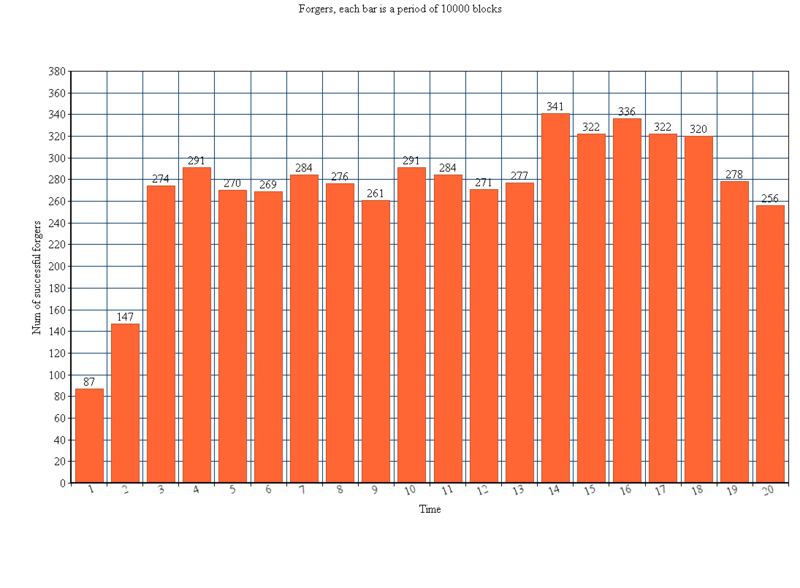 That number increased to 200 at the beginning and is now roughly stable. I would have expected a further increase overtime, but perhaps this is correlated with the demand for Nxt. More buyers coming in should diversify this number more. the code for generation this information. String stmtStr = "SELECT generator_public_key, height, timestamp, total_amount FROM block where total_amount >= 0 and height > "
here the same for 10'000 intervals. this link opens for you? can see it now, thx. What is the value of 1 time unit? 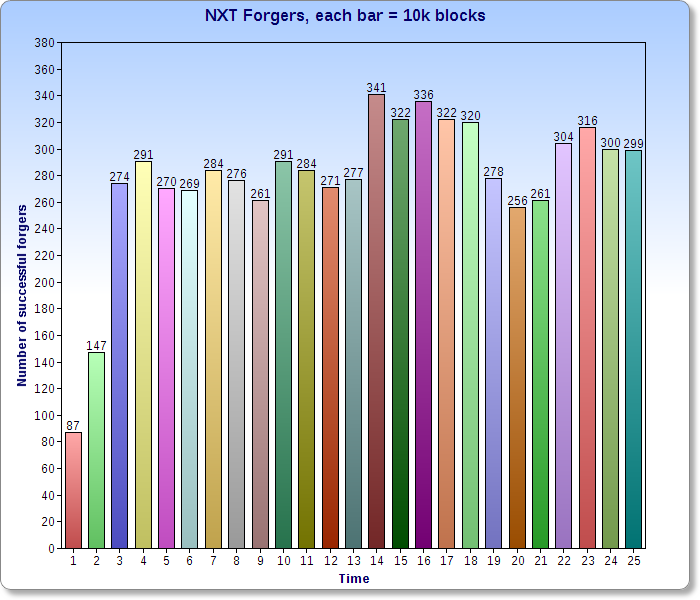 Each bar is 10k blocks (~12 days). Interesting. Could you provide the correlation via a chart? Price movement from April to today. It's not a 100% correlation, but it's noticeable. Price moves higher (after AE was launched), more accounts forge. Price corrected in July, the number of forging accounts dropped. Which could be predicted and quite natural. Let's see what happens in the next few weeks and months, when price hopefully goes up again, I'll remember to post an update. Could it be that number of sucessfull forgers is low when only few transactions with fees are initiated (low volume)? It wouldn't be the price increase explaining the increase in number of forgers, but rather the number of transactions with fees. You're right, it's correlated with volume of txs too. the volume of txs peaked on June 9, a lot of txs are related to AE, now it's stabilized at a lower level, down to 1500-2000 daily txs, in April before AE launched it was less than 1000 txs per day. Interesting.. would also be interesting to know what percentage of the network is forging in terms of percentage of all Nxt. Did that greatly increase after leasing for example? Seems like it would be a similar script. Latest data. 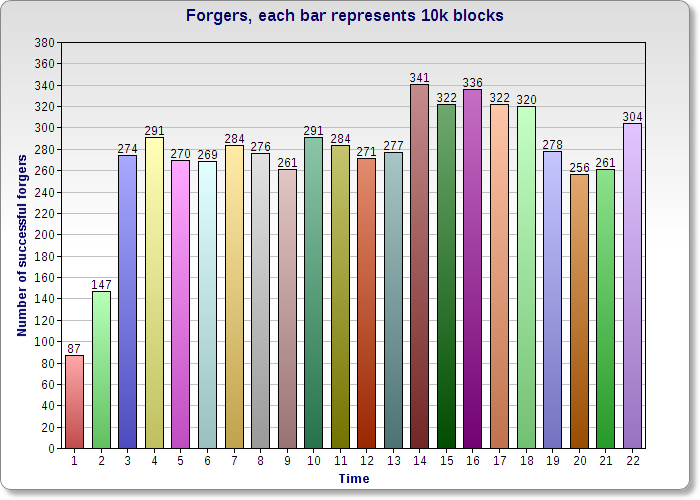 The spike to successful 304 forgers in the last 10k blocks is due to the Bter hack (at block 209886), after that forgers were involved in two competing forks? This time this is the only explanation, for price has been sliding downhill or sideways at best. 1/6 of accounts are lazy to forge during quiet times or when price is going down? That is an interesting chart, +1.